This collection includes our favorite repurposed wall pieces. Each is made from an old piece of furniture, a dresser drawer front, or a cabinet door. 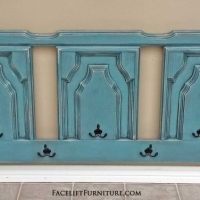 We used the same paint, glaze, and distressing technique we use to refinish furniture. With added hardware, you can see great possibilities come to life! The photos include wall displays full of our favorites, followed by individual photos of pieces found in the display. Please click on the photos for a full view!